The water cycle, also known as the hydrological cycle or the hydrologic cycle, describes the continuous movement of water on, above and below the surface of the Earth. The mass of water on Earth remains fairly constant over time but the partitioning of the water into the major reservoirs of ice, fresh water, saline water and atmospheric water is variable depending on a wide range of climatic variables. The water moves from one reservoir to another, such as from river to ocean, or from the ocean to the atmosphere, by the physical processes of evaporation, condensation, precipitation, infiltration, surface runoff, and subsurface flow. In doing so, the water goes through different forms: liquid, solid (ice) and vapor. 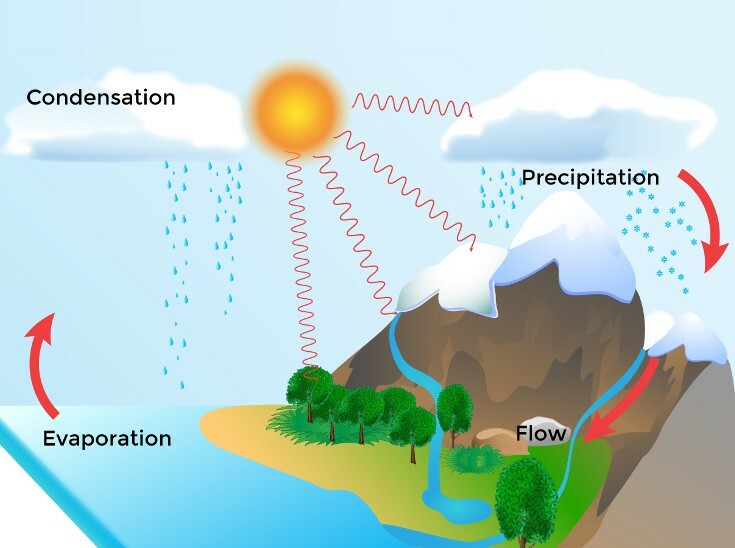 The water cycle involves the exchange of energy, which leads to temperature changes. When water evaporates, it takes up energy from its surroundings and cools the environment. When it condenses, it releases energy and warms the environment. These heat exchanges influence climate.